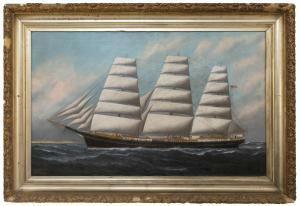 Find artworks, auction results, sale prices and pictures of Solon Francis Monticello Badger at auctions worldwide. 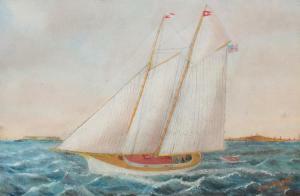 BADGER, Solon Francis Montecello (American, 1873-1919): Two Mast Schooner off the Coast, Oil/Artistboard, 12.25" x 18.5", signed lower right and dated 1888, also signed verso and dated, framed, 16.5" x 23". Badger was once known as Samuel; he was largely self-taught as a painter. Solon sometimes worked from blueprints of vessels and was known to sail the Boston Harbor to measure vessels for his paintings. His works can be found in several museums in New England. 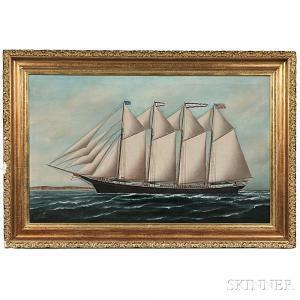 Lot 2062: SOLON FRANCIS MONTECELLO BADGER (American, 1873-1919) PORTRAIT OF THE SCHOONER "BESSIE C. BEACH".
. 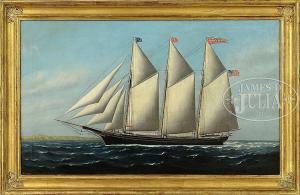 The four-masted ship identified on the bow, stern, and pennant, sailing with a lighthouse above sandy bluffs off its starboard bow. Signed and dated "SFM Badger 01." l.l., further inscribed on the reverse "SFM Badger '01 Charlestown Mass." Oil on canvas, 26 x 42 in., in original giltwood and gesso frame. Condition: Good. was built by Dunn and Elliot of Thomaston, Maine, in 1900. She foundered off the coast of Pensacola, Florida, in 1913. SOLON FRANCIS MONTECELLO BADGER Massachusetts, 1873-1919 Portrait of the Harvard. Signed lower left S.F.M. Badger Charlestown, Mass". Also signed verso. Oil on canvas, 26" x 42". Framed 35" x 50"." Condition Original canvas. Moderate to heavy soiling. UV light reveals no obvious restorations.